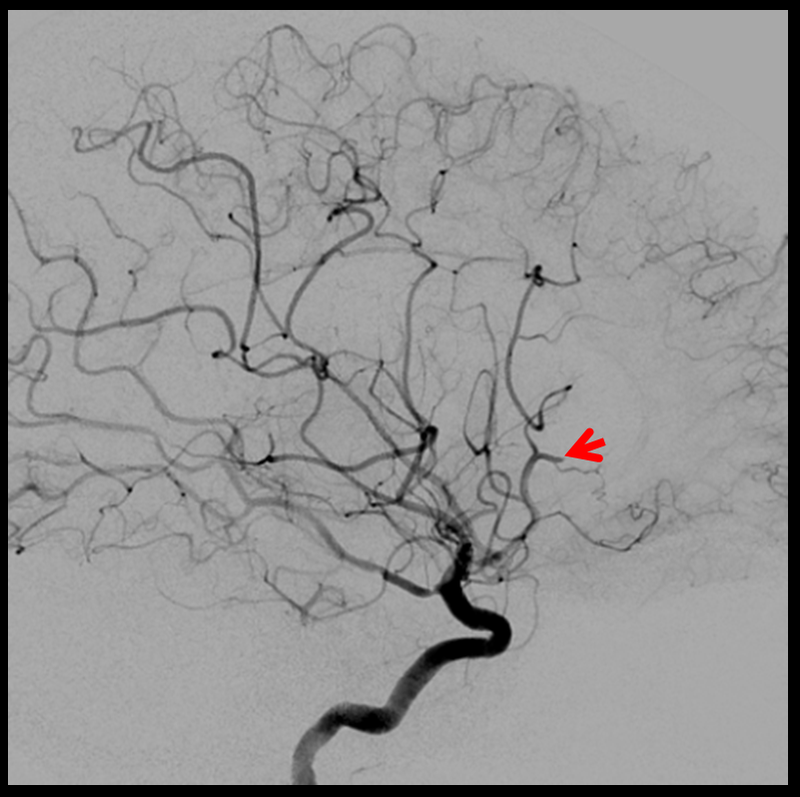 Leptomeningeal collaterals eventually fail in acute large vessel occlusion. They fail even if they look good. Even if they look really, really good. Sure, they can last long enough to make DAWN and DEFUSE-3 a success. But we do not know how collaterals behave over time across different individuals. What we know is that it is nearly always a mistake to assume that they will last indefinitely. 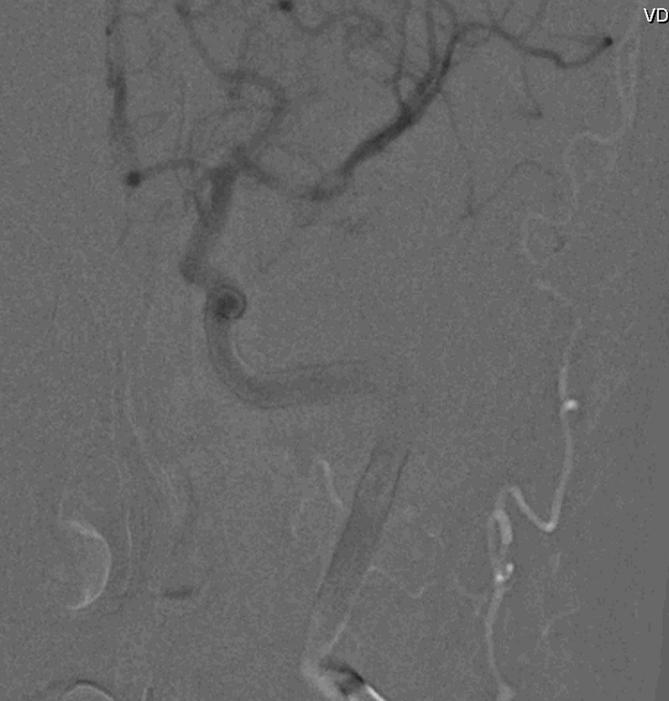 CTA shows superb leptomeningeal collaterals which retrogradely opacify the left M1 all the way to the M1 bifurcation. This is a carotid T occlusion, with no contrast in the supraclinoid segment (red arrow) and furthermore in the proximal near-fetal PCOM. 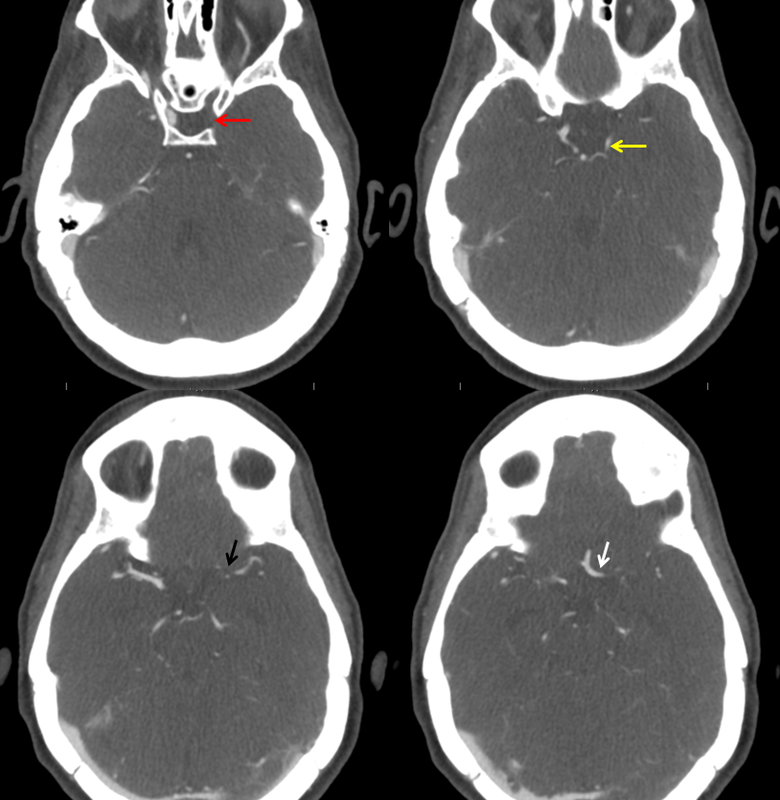 The distal PCOM is visible (yellow) via a small P1. 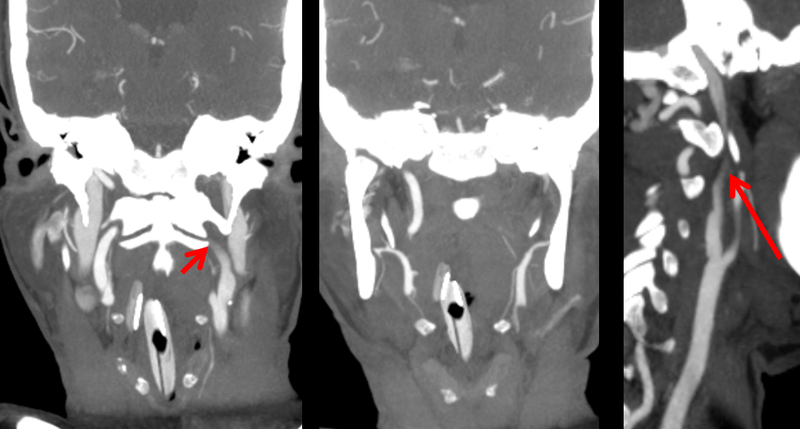 Part of the clot sits at the carotid bifurcation area (black arrow). 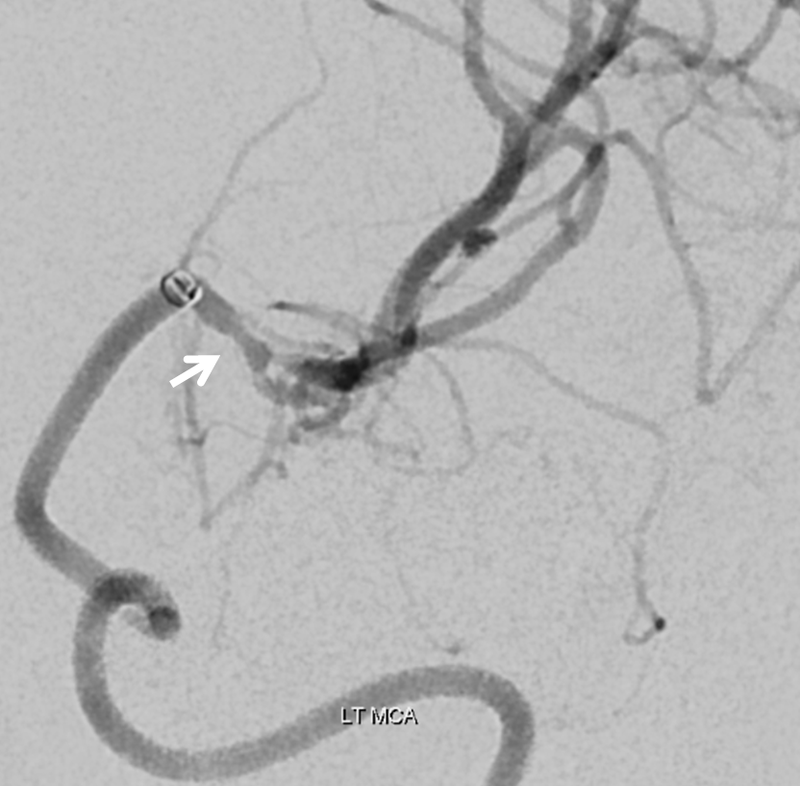 The flame-shaped contour of the left ICA (arrows) suggests cervical segment pseudo-occlusion with lack of inflow on CTA. 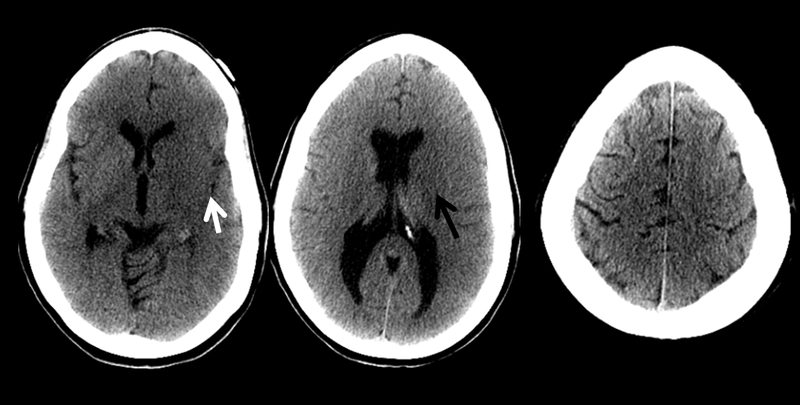 For variety of exceptionally unique circumstances, a delay of about 10 hours took place prior to patient arrival at institution B, followed by this CT. There is now loss of insular ribbon and a more well-defined infarct in the basal ganglia. The convexity however still looks hopeful, at least to the ASPECTS crowd. 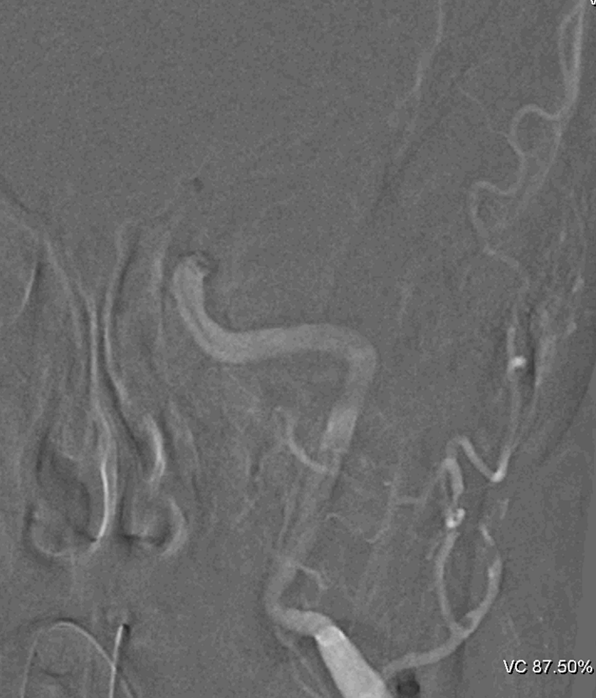 This CTA was obtained immediately after the above CT. 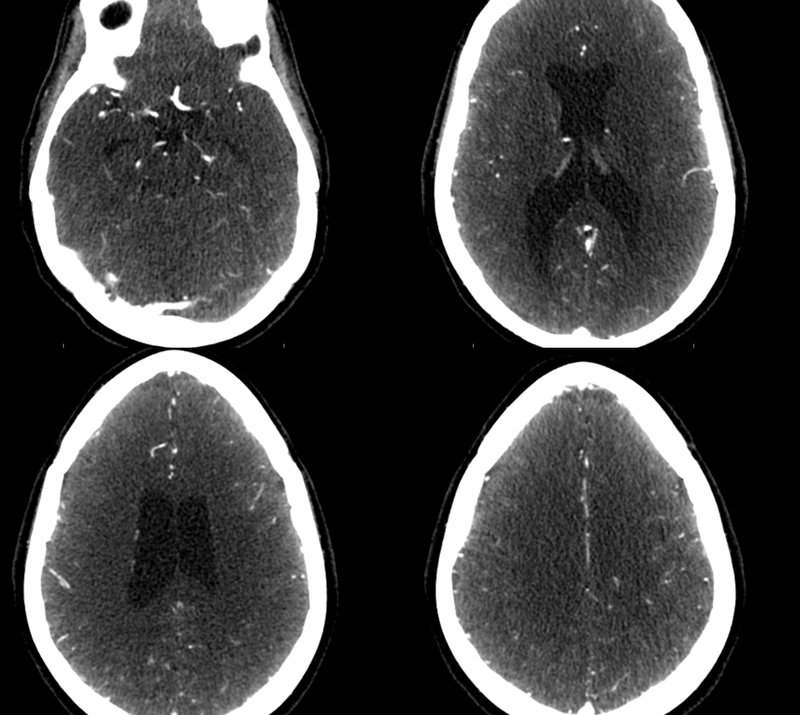 This picture is dismal; much more so than the noncontrast CT above — a complete interval failure of leptomeningeal collaterals with full MCA and near-complete PCA infarct. Contralateral injection is the angiographic equivalent of CTA with no effective collateral. Same on the vert side. The PCOM is opacified retrogradely to its origin. A pseudo-occlusion of cervical ICA. Contrast layering in the distal portion is one sign. 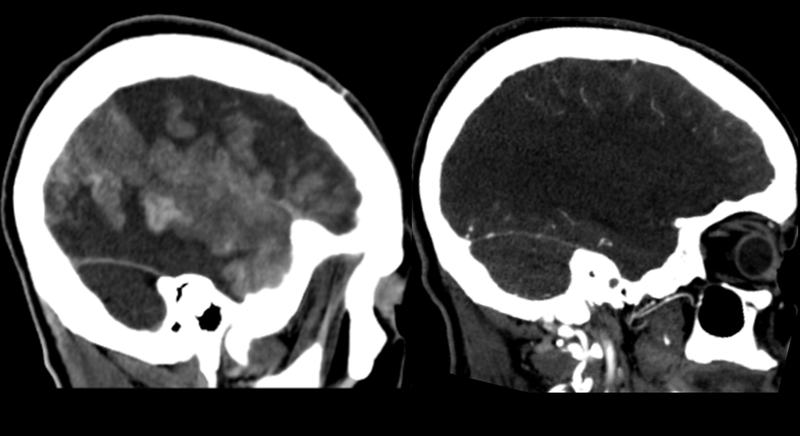 A more distal apparent occlusion than typically seen in atheromatous disease of the bulb is another. There is however some athero at the bulb. 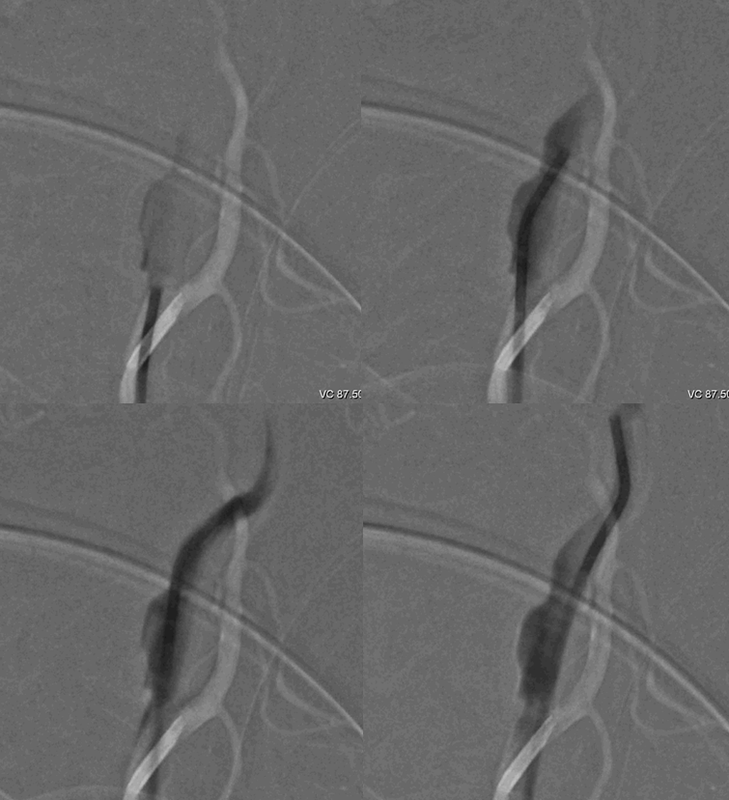 A Sofia 6F catheter in the supraclinoid ICA. Two passes were required. Two very different thromboemboli were removed after first (top dark) and second (low pink) aspirations. The lighter, relatively shorter embolus is likely the original source of occlusion. 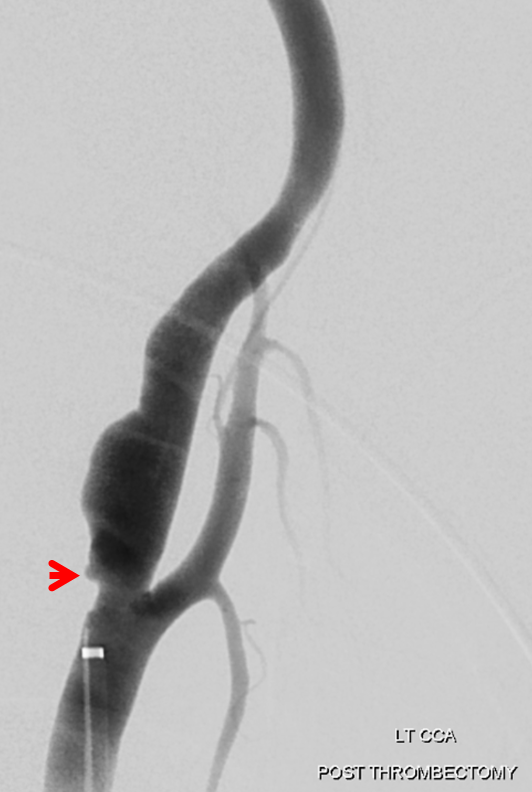 The darker, longer, more proximal clot probably formed secondarily, in the interim between index embolus and eventual aspiration. Delayed view shows small M1 stenosis (white arrow), where the original embolus got stuck instead of progressing to the usual M1 bifurcation. The bifurcation was visible on the original CTA. 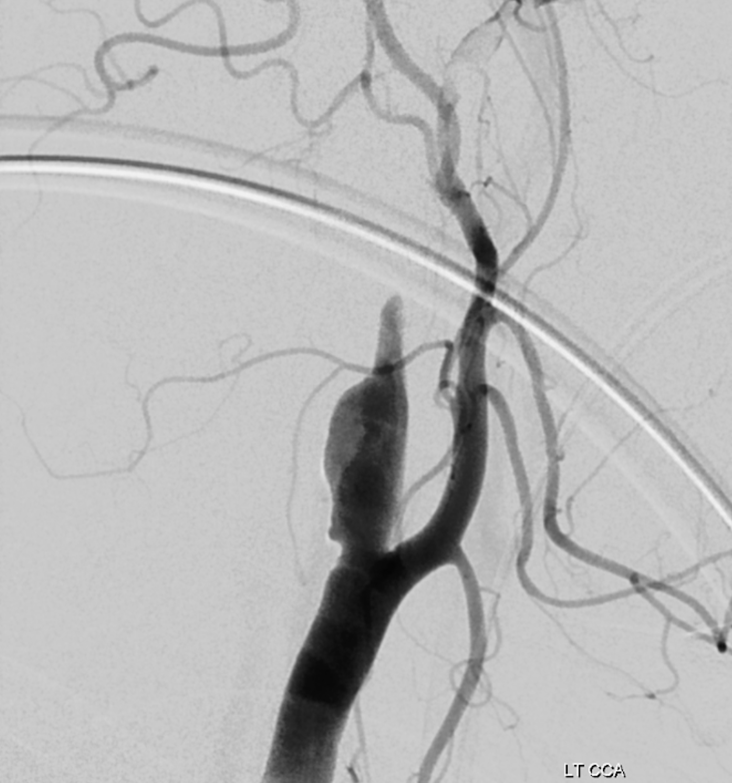 There was no other source found except for this irregular carotid bulb plaque — probably an artery-to-artery embolus. 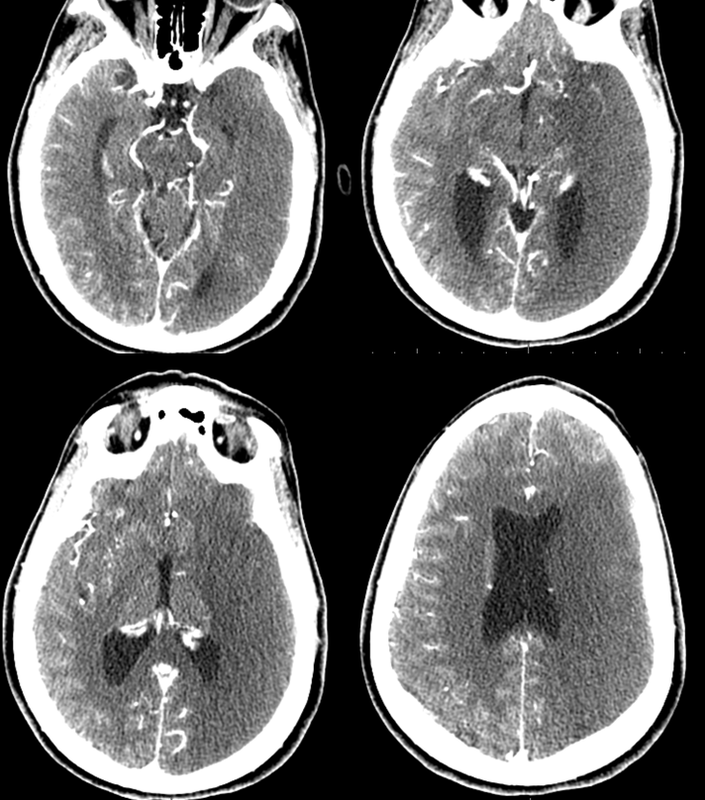 A depressingly predictable post-procedure noncontrast head CT shows the full extent of catastrophe, with angiographic contrast in dead brain and early mass effect. The equally dead superior frontal convexity (arrow) is unstained due to occlusion of its feeding branch, mockingly preserving its “grey-white” junction. 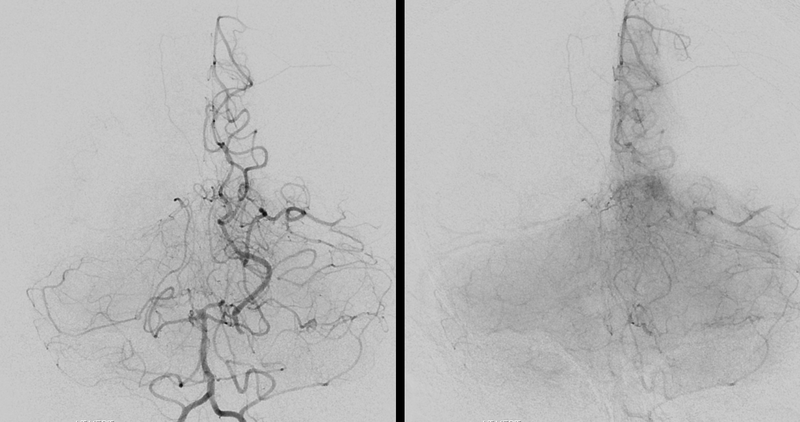 More and more, in the US at least, the fate of large vessel occlusion victims is determined by circumstances in the field rather than in the angio suite. The real life savers, going forward, will be those who implement and maintain efficient stroke identification and transport networks. We have lots of work to do in that neck of the woods.